A cloud-based Internet terminal management system for small to medium volume facilities. 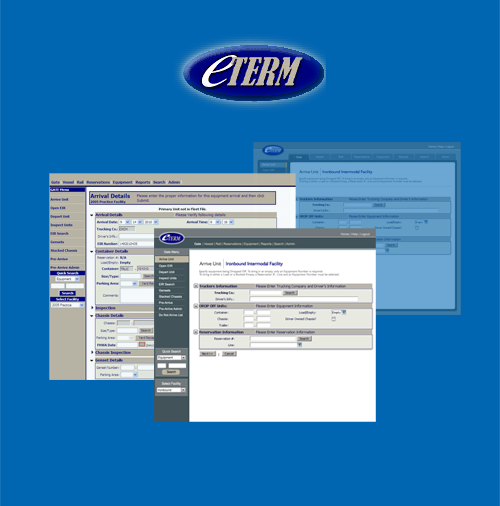 Using the Internet, eTERM™ is available to your employees, vendors, truckers and customers 24/7. Pay-as-you-go model so low upfront investment. eTERM™ is fully scalable. TransTech provides all upgrades and maintenance. Easy to use no matter what your level of technology know-how. Includes all core terminal management functions – gate, yard, reports, etc. Includes EDI gate/yard activity from the terminal to your customers and EDI bookings and bill of ladings from your customers to your terminal. Also available as a licensed software application run on the customer’s hardware. interfaces to standard accounting packages minimizing errors and expediting your billing process. Eliminates manual pilot scheduling "boards" replacing them with a web-based system capable of tracking all vessels, pilots, docks, piers, anchorages, work orders and pilot assignments in real-time. Offers remote access for pilots, customers and vendors. Designed to run on either a single or dual server environment. The dual server environment has built-in fault tolerance. ePILOTS™ can be combined with a Virtual Private Network (VPN) to increase the security of the system for outside users. Contact us at info@transtechpartners.com for more details. ComPairData is comprehensive comparative database designed to allow shippers, forwarders, carriers and ports to quickly compare ocean carriers, their services, finances, vessels and schedules. Compares real services over a range of ports. Services are also identified as direct, feeder or intermodal connections. Trade Routes List - available routes for ports of call and transit time comparisons.